I grew up back in the 70’s with the ubiquitous spinach salad. It was the salad that everyone served for dinner or shared at potlucks. It was your basic bowl of spinach leaves and mushrooms (maybe hard-boiled egg?) and it was topped with a hot bacon dressing. Anyone remember that salad? Anyone still make that salad? I actually really loved that spinach salad. I’ve been meaning to ask my Mom if she still has that 70’s spinach salad recipe in her files somewhere. 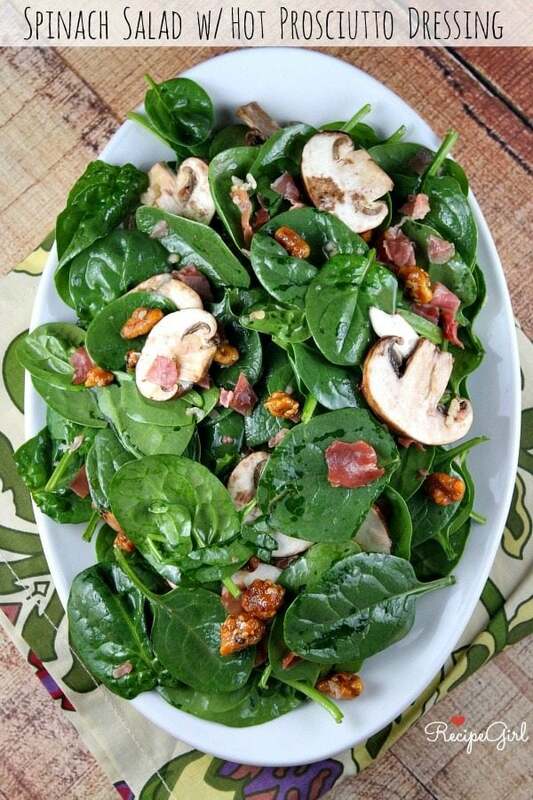 In the meantime, I’m sharing an updated version of the spinach salad. This one switches out bacon for an equally desirable prosciutto. Walnuts are added in for good measure. You can (and should) toast them a bit, unless you’re okay with raw walnuts in a salad. Toasting them makes them 100% more delicious, in my opinion. Or you can do as I did and buy a package of candied walnuts (or make your own). The best part of this recipe is the dressing. It has flavors of wine and lemon, it’s lightly sweetened, and it has a generous dose of chopped prosciutto mixed in. In the end, the whole thing is topped with shredded Parmesan. I went with a beautiful, rustic chunk of rather expensive and amazing Parmigiano-Reggiano, but you can certainly use any Parmesan you have on hand. This is one delicious salad indeed. My husband and I practically ate the entire thing split between the two of us, but it is perfect for serving four as a side salad. Dare I say that my version is a vast improvement over the 70’s spinach salad? I’m cool with that. We truly enjoyed this recipe- it’ll be a repeater for sure in our house. 1. 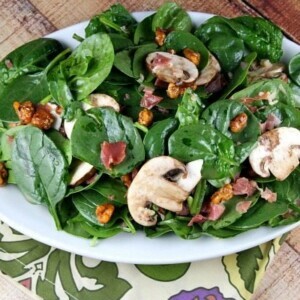 Place spinach in a medium-large salad bowl. Sprinkle on mushrooms and walnuts. 2. Prepare the dressing: In a small saucepan, heat oil over medium heat and add prosciutto and garlic. Stir and cook until garlic is lightly browned. Stir in wine, lemon juice and sugar, and continue to simmer for about 5 minutes, stirring every once in a while. 3. Pour hot dressing over the salad and toss. Divide salad between four serving plates and sprinkle each with Parmesan cheese. *If you are preparing this recipe as gluten-free, just be sure to use a brand of prosciutto that is know to be GF. Was craving a salad with a warm dressing. Wanted to use my presuitto up, and I found your recipient. Between my sister & I we roundedup all the ingredients which between the both of our households we had on hand. Can’t wait til we have supper tonight. Thanks your an ???? in disguise. Ooooh I love this salad! My mom still makes the spinach salad that you mentioned, it was actually one of my favorites growing up. I love this updated version though, especially the prosciutto! I’ve been in a salad rut lately. I’m going to try this soon! Thanks, Lori! I was just looking for a salad to take to Nick’s grandmas 90th birthday party! This looks like an oldie but goodie!! Love it! I looooved that old ’70s spinach salad with bacon dressing! This reminded me of it as soon as I saw the title of the recipe. Thanks! Lori, I do not use pork products. How is this without the prosciutto? Any thoughts on a substitute (turkey bacon, perhaps)? Thanks! You can certainly sub something else! Great salad Lori! beautiful pics! 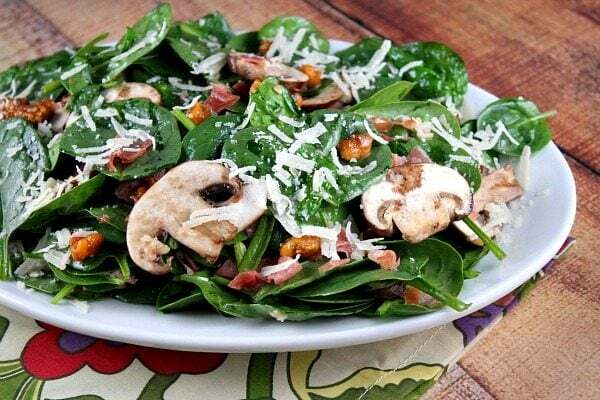 I LOVE spinach salad and will never tire of it. There’s something about it that combination! I agree on the toasted walnuts — so much better that way. Great looking salad, Lori! 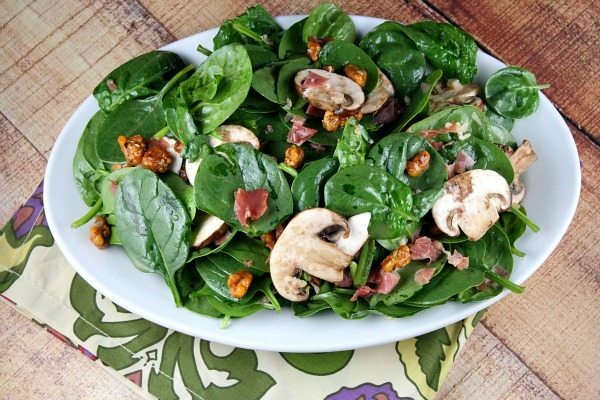 This is such a great update to that spinach salad! Love the prosciutto! Lori, this is an absolute favorite! Love this salad!! All ingredients are at home, can harly wait to be back and make it tonight. Why yes, yes I do. I include goat cheese and candied pecans to the original mushrooms, red onions and hard boiled eggs. Thanks for sharing this one. I love this Lori…switching out the cured/smoked bacon for prosciutto!! YUM! I’ve made something similar but with bacon. I need to try this version with proscuitto. Love! I eat spinach almost every day! This is a great way to shake it up a bit. Looks yummy! Loving this improvement from the classic 1970’s salad recipe, Lori! My hubby and I love the bacon version and I just know we could polish off this entire recipe together, too. 🙂 Thank you for sharing. Pinned!